A constraint that evaluates to true only when a full-text search applied to the search scope results in positive findings. If a property name is supplied, then the search is limited to the value(s) of the named property on the node(s) in the search scope. A set of FullTextSearch.Terms that are ORed together. A FullTextSearch.Term that represents a single search term. The general notion of a term that makes up a full-text search. Create a constraint defining a full-text search against the node within the search scope. Get the full-text search expression, as a string. 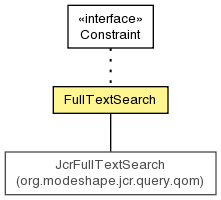 Get the formal FullTextSearch.Term representation of the expression. Get the name of the property that is to be searched.